Your first international trip is happening! You’re finally going to jump on that plane and explore a new country! Going on your first trip abroad is thrilling. However, it can also be overwhelming and nerve-racking. What do I pack? Do I need a visa? Do I need vaccines? How do I book my airfare? I’m sure you have a general idea of all the sights you want to see and the delicious food you want to indulge in. In reality, planning the logistics of your trip requires thorough research. 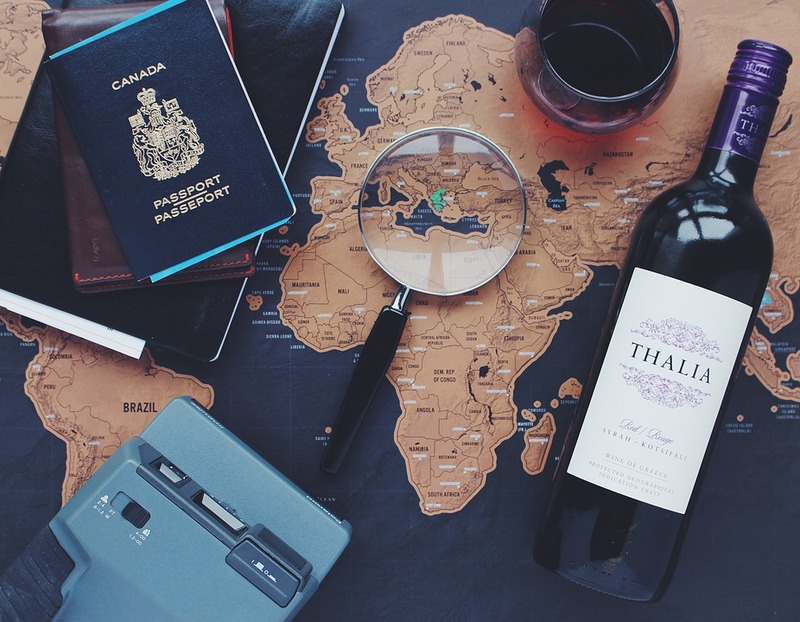 So, who do you trust to help you with the ins and outs of your first international trip? Hopefully, your answer is “experienced travelers.” Well, I’m a fairly experienced traveler! 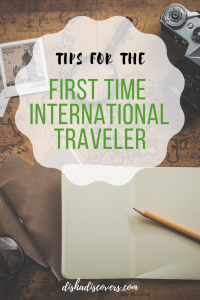 Here’s a list I created that’s filled with tips for first-time international travelers. I hope my tips help you have a comfortable and smooth time on your first adventure abroad. Before you can travel abroad, you will need a passport. In the States, it will usually take six to eight weeks to process. If getting your passport slipped your mind, you can pay an additional fee to get it expedited. However, the fee is pricey and that’s money that you can be spending on your trip. Don’t wait until last minute to apply for your passport. Click here to find the location nearest you to apply for your passport. If you already have a passport, make sure it has six months of validity from your departure date. Some countries will deny you entry if your passport is set to expire within six months. If you come from a country that has a strong passport like the United States and the United Kingdom, you’ll be able to visit a lot of countries without needing a visa. At the same time, make sure you do your research and see if the country you are going to requires a visa. An easy way to determine if you need a visa is by visiting the embassy website for the country you are going to. I’ve traveled to 71 countries and have been able to apply online for my visas. Once approved, I print the approval letter and present it to the customs officials upon entering the country. Depending on the country you visit, you may have to print paperwork out and mail it the embassy of the country you’re visiting. Then, they will mail you your visa. Give yourself plenty of time to apply for a visa if you need one as the process can take a few weeks. You can use this website to check if you need a visa. If you’re going to Africa, I highly recommend getting vaccines for yellow fever and malaria. Obviously, I’m not a medical professional. Regardless, I have friends who have gotten malaria because they didn’t get the vaccine. According to them, it’s not a fun thing to have. Click here to access the CDC website to see their recommendations for vaccines, health notices and helpful information regarding your destination. You probably already have a general idea about what you want to do. what attractions you want to see and how you plan on getting around. If you plan on going to a lot of museums and parks, research the entrance prices. Research ticket prices if you plan on taking public transportation. If the main attractions are clustered in one area, I like to walk from attraction to attraction. On the contrary, major attractions in some cities may be spread out across miles. If that’s the case, I like to go on a city tour. The city tours are usually cheaper than taking a taxi from one attraction to the next and it takes the stress away from having to get from one place to the next. My favorite companies for tours are Big Bus Tours and Viator. If you plan on taking a taxi, I suggest negotiating the price with the driver before getting into the taxi. Not all taxi drivers are deceitful, but some can be. It’s better to tell them exactly where you’re going and ask for an approximate price beforehand. I know some of you like to plan your own trip. I sometimes want my trips planned for me. Operators such as Contiki and TourRadar eliminate the stress of planning a trip. You just show up at their meeting point, and they take care of the accommodations and transportation from Point A to B. It’s that simple. Plus, it’s a fun way to make new friends. I’ve seen some incredible deals on both of these websites. Sign up for their newsletters so you can be notified of discounts and sales. Even if you want to plan your own trip, both of these websites are a good reference for how much your budget should be. Depending on how far you’re going, you’re probably going to have to book a flight. I always start my flight searches with Skyscanner and Kiwi.com because they show you the cost of flights from multiple airline carriers. Don’t forget to sign up for the airline’s frequent flier program so you can start earning airline miles. Airline miles equals free flights. YAY! If you want to learn how to score cheap flights, sign up below and I’ll email you a free guide. In the event that you fly a budget airline, your carry on limits will usually be one bag and one personal item both totaling to seven kilograms. I never check my luggage so I pack light. It fits all of my belongings and it’s lightweight and durable. My favorite part about planning my trip is booking my accommodation. Accommodation near major landmarks and tourist attractions will be more pricey. As a result, you want to make sure that your hotel or hostel is close to public transportation routes so you can get there easily without paying a premium for the hotel or hostel. Also, cheap does not always equal good. I booked a cheap hotel in Athens and it was in an incredibly unsafe area. I feared for my life when I was walking in that neighborhood. Learn from my mistake and make sure your accommodation is in a safe area. Use Google Street View to check out the local area. I mainly use Booking.com because they provide clear pricing with no hidden fees and you get to join their loyalty program for free which will get you freebies and discounts. I’m also a huge fan of Agoda. I was having a hard time finding a hotel in the Philippines. I got on Agoda and found a gold mine of hotels that other websites weren’t listing. In my opinion, you should consider getting travel insurance before your trip. Most policies in the States don’t cover illnesses or injuries that happen abroad. Every plan is different so be sure to do your research before picking one. Having travel insurance is worth the peace of mind in case your flight gets canceled or you get sick. RoamRight is my go-to for travel insurance. The coverage and the prices are fantastic. Leave a copy of your travel insurance with your loved ones just in case something happens. 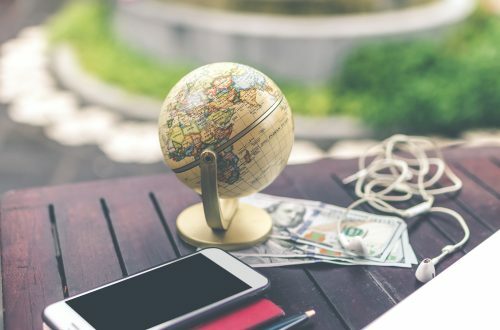 If you plan on using your credit card abroad, make sure it doesn’t have a foreign transaction fee. These fees can add up really quick. It’s also useful to have an ATM card that doesn’t charge a withdrawal fee. I have a debit card through Charles Schwab and I don’t owe anything for withdrawal fees. Charles Schwab has saved me hundreds and hundreds of dollars in withdrawal fees. Speaking of credit and debit cards, be sure to keep a copy of your card details and company phone numbers in a safe spot. In the event that you lose your card, you have the card information readily available to close the account. There are several ways you can get local currency. You can money exchanged at your local bank before you leave for your trip. You can also exchange it at the airport when you get there. However, this is the least efficient and most expensive way to get local currency. You can use an ATM once you’re there. Or you can just use your credit card if the store or restaurant accepts them. If you use your credit card, have them charge the amount in the local currency. I get a better exchange rate this way. Don’t forget to download a currency conversion app. Some currencies are easy to convert in your head and some are difficult. I use “My Currency Converter & Rates.” I love it because it’s user-friendly and works offline. It’s also smart to keep a small reserve of USD or Euros with you just in case the ATMs don’t work or you have unexpected visa fees. I always travel with a minimum of $250 USD in case of unexpected expenses and I’m not able to access an ATM easily. Write down the address and phone number of your accommodation and keep it handy. You’ll probably need to provide this information to customs when you arrive. I also carry a business card of the hotel or hostel I’m staying at. If the taxi driver doesn’t speak English or I don’t know enough of the local language, I can hand them the card and they will know where to go. Furthermore, make a copy of your passport and keep it in a safe spot in case you lose the original. That will make your life easier in case you misplace it. Speaking of passports–leave a copy of your passport at home with your family just in case something happens. Do you want to pay a million dollars for roaming? Didn’t think so. Keep your phone on airplane mode and purchase a SIM card when you get to your destination. Local SIM cards aren’t that expensive and the service is usually faster. Notify your bank or credit card company before you go on your trip so they can put a travel advisory on your card. I forgot to put a travel advisory on my card once and had my card frozen. It’s a hassle having to call them while you’re abroad to get the charge approved. On my husband’s first international trip, he had his card frozen because he forgot to notify his bank of his travels. He was in Paris about to catch a train to Luxembourg. His card was declined three times. He called his bank several times and couldn’t get a hold of them because it’s a small bank and the office was closed. Therefore, he missed his train and was stuck in Paris. I sometimes don’t buy a SIM card and having Google Maps and Google Translate downloaded offline helps me tremendously. I’m able to have directions and a translator without needing Wi-Fi or service. I use Google Translate quite often when I’m speaking with locals. The translations aren’t exact, but they’re close enough to understand. Google Maps allows me to explore a city without getting lost when I don’t have cell service. In all honesty, you’re probably not going to wear everything you bring. Do whatever it takes to pack light. It’s rather annoying having to carry around things you don’t need. Don’t pack something just because you think you may need it. If you need it, you’ll probably find it at your destination. Don’t forget an adapter though! Here’s the universal adapter I use and love which works everywhere in the world. Also, don’t forget to take a portable charger with you. It really comes into use when you’re sightseeing all day and your battery starts running low. Here’s a handy list of adapter information for every country. It’s not fun getting robbed and pick-pocketed. Be attentive to your surroundings and try not to advertise that you’re a tourist. I try not to use my phone in public too much. If I’m lost, I act like I know what I’m doing. Make sure you divide your valuables and keep them in different areas. For example, I put some of my belongings in my jacket pocket, some inside my hidden pockets on my pants and some in the safe in the hotel room. If something happens, I don’t lose everything. This is the most important thing you should do before visiting a new country. First of all, you should learn how to say “hello,” “please,” and “thank you” in the language that is spoken in the country you are visiting. This will go a long way. Don’t worry about mispronouncing words. Locals are more willing to help you out if you are showing an effort to speak their language. Also, learn about the norms of the said country. For example, you should dress modestly if you are visiting the Middle East. If you are visiting countries in Asia, you will be expected to take your shoes off before entering someone’s home or shop. Furthermore, tipping is expected in the States. In some countries, it’s not. Go in with an open mind and don’t expect things to be how they are at home. Just because something is different doesn’t mean it’s wrong. We travel to experience the diversity in this world, right? Focus on the positive things and you’re bound to have a great time. Enjoy wherever you’re at. Live in the present. Soak in all the culture and the cool experiences you’re having. Eat all the delicious food (use your judgment though). Make friends with locals. Use your common sense and experience everything you can! Do you have any tips for first-time travelers? 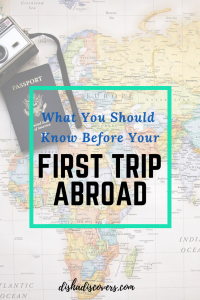 What is something you wish you would have known before your first international trip? Let me know in the comments below. Great advice! All of it is spot on. I learned the hard way to call my bank before I leave! I appreciate the security, but having my card declined was a nasty surprise. Thanks for reading! Yes, calling the bank before you leave is a must! Live this posy, great advice! These tips are perfect for first time travelers — super simple, but covers everything! Thanks for sharing these. Really great article, it always frustrates me when I think of how few Americans travel internationally. Then I have to remember that it must be daunting to do it for the first time, whereas I grew up traveling! Thank you so much! I totally agree with you. I think people are just misinformed sometimes and don’t know where to start. But, once you start traveling you get the hang of it. These are all really valuable tips for a first time traveler. Some things as simple as currency exchange can really cost you a lot! Totally agree on the importance of learning a bit about the culture. It’s both responsible and respectful. 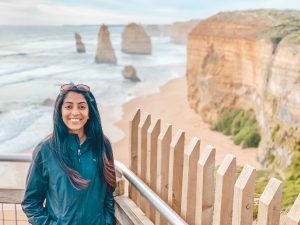 Great tips for those who are new to travel, you covered everything! This is a pretty comprehensive list! A lot of people forget the part about vaccinations. We should always do as much research as we can before we land in a new country. Thanks for reading! I agree with you. for me on Opera. Outstanding Blog! I could not resist commenting. I love all of these tips. I know it can be really scary when you are traveling for the first time. The tips you give are so comprehensive and so useful to be prepared to lessen those fears for first timers. Wonderful and practical advice! As a long-time traveler these are definitely things I talk about with my less traveled friends. All very relevant! Thanks for reading! I’m happy to hear that my tips are useful to you. Thank you for reading! Sorry to hear about your card numbers being stolen. That’s no fun. I’m glad you caught that really fast. Hi Disha, I love this post. 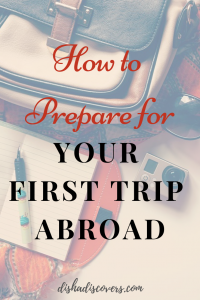 This is a perfect checklist for traveling abroad even if it isn’t your first time. 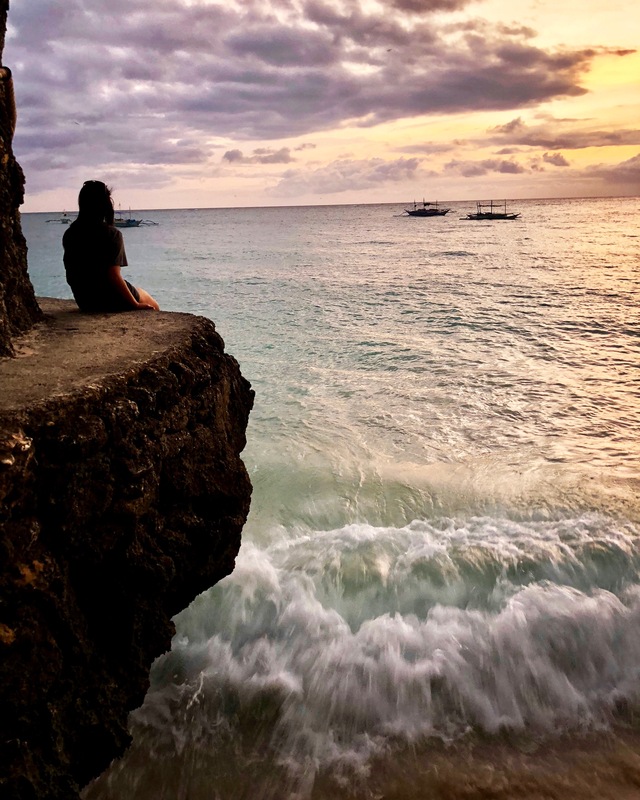 Lots of reminders of what to do and how to handle yourself traveling to a new place. I may create my own checklist and include all of these important points to check off. Great post.